Hello and welcome back to another update of Forgotten Hope 2. Our render for today is of one of the most famous and well-known Soviet infantry weapons of WWII; the PPSh-41 submachine gun. The PPSh-41 was intended to be an inexpensive replacement for the older, PPD-40 SMG, which had been in use since the mid 1930s. The PPSh was mainly a poor man's infantry weapon. It was made from wood and stamped steel, with the barrels made from halved M1891 Mosin-Nagant barrels. The result was a simple SMG with a fire-rate of 900 rounds per minute, that could be produced in mere hours in garages and industrial shops by relatively unskilled workers. Over 6 million of these weapons were produced, and thus used in almost every thinkable way. Entire Soviet divisions were sometimes equipped with the PPSh, and even the German Army officially adopted it. However, one of the most bizarre uses, was as a close-air support weapon, where several of these SMGs were mounted to the forward racks of the Tu-2 bomber. 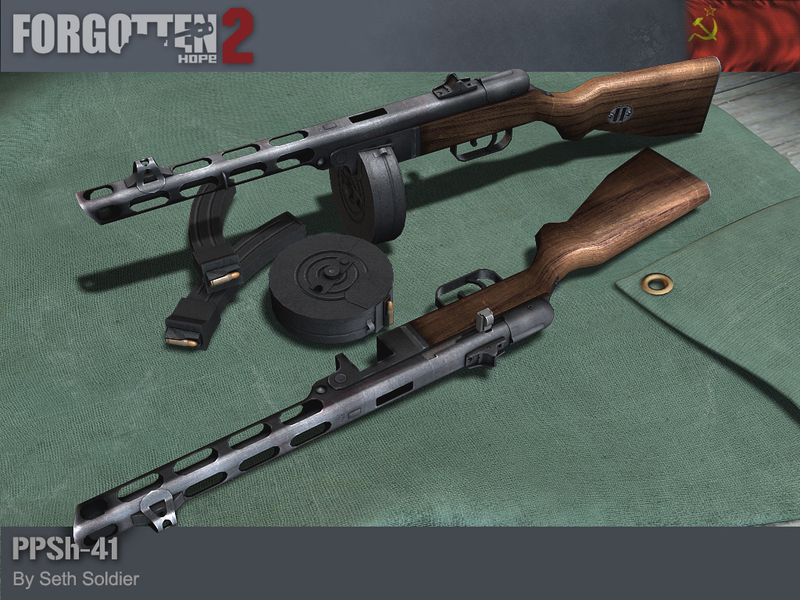 The PPSh-41 submachine gun was made by Seth Soldier. Our winner for this week's screenshot competition is Kelmola. You can view the winning submission here. We are now accepting entries for the week of Oct. 23rd. If you think you have the best FH2 screenshot, post them here. That's all for this week, but be sure to come back next week for another update. Until then, feel free to visit our IRC channel channel, our public forums, and/or our Twitter and Facebook pages to discuss this update and other news.